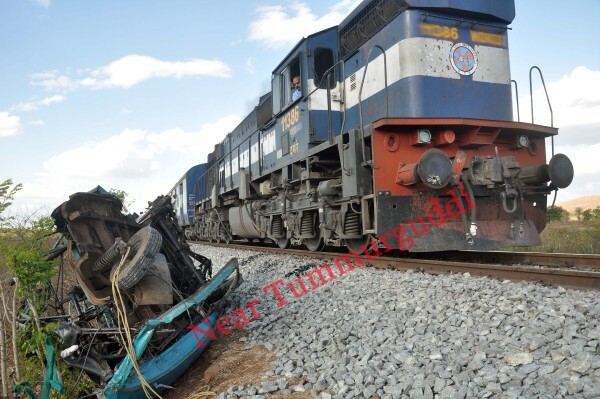 One person was killed and 3 others injured when the goods rikshaw they were tr4avelling was hit by a passenger train near Tummerguddi village, near Karikatti cross in Belgaum taluk. The deceased has been identified as Ramlingaiah (35) of Ugarkod in Bailhongal taluk. Injured include Javed Tanveer Langoti (26) of Hosur, Belgaum, Yeshwant Siddappa Kutabagi (30) of Ugarkod and Tanaji Gopal Mandvi (20) of Ugarkod. According to the police all of them were labourers who were working at a water tank construction site at Tummerguddi village. While returning back from work and while crossing an unmanned rail crossing their vehicle was hit by a Belgaum – Miraj passenger train.